While he wasn’t part of the original Super Mario Brothers, in fact, he didn’t come around until much later in the series during the 4th full game, Super Mario World, Yoshi is as iconic to the Mario series as any of the main cast. The popular Dino has even gotten several of his own spin off games. He certainly makes sense as an addition to the Mario Figuarts lineup. Yoshi is quite a different little figure than Mario and Luigi, for the obvious reasons that, he’s a Dinosaur and not a plumber. He’s actually a quite a bit more dynamic in some ways as a result. His skinnier arms give him a lot more flexibility for outward motion than the Mario Brothers. While his hips can rotate outward as well, he doesn’t have any knees. I’m not sure where they would put the knees considering how short his legs are, not to mention the addition of knees would probably hurt his major gimmick. That major gimmick? Mario can ride Yoshi. 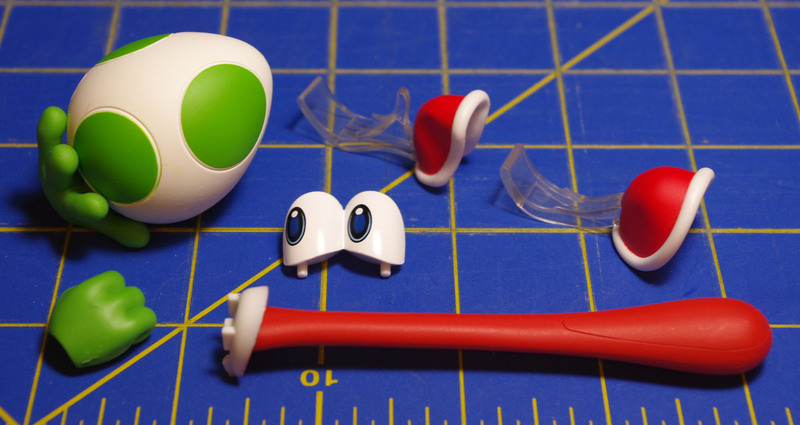 Included among Yoshi’s accessories are two alternate shell pieces each with a clear saddle attached to hold Figuarts Mario or Luigi. 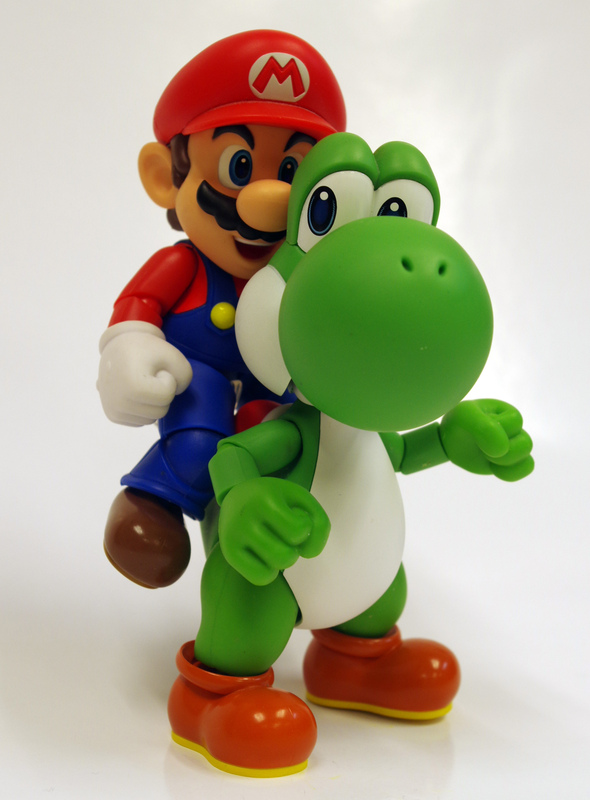 It’s a bit tricky to get Mario’s weight to balance on Yoshi without the use of a stand however. Mario is a pretty heavy figure and sticking all that weight on the back of poor little Yoshi really sets things off balance. It’s still a really nice touch to have it as an option given 90% of Yoshi’s function is carrying Mario around on his back. 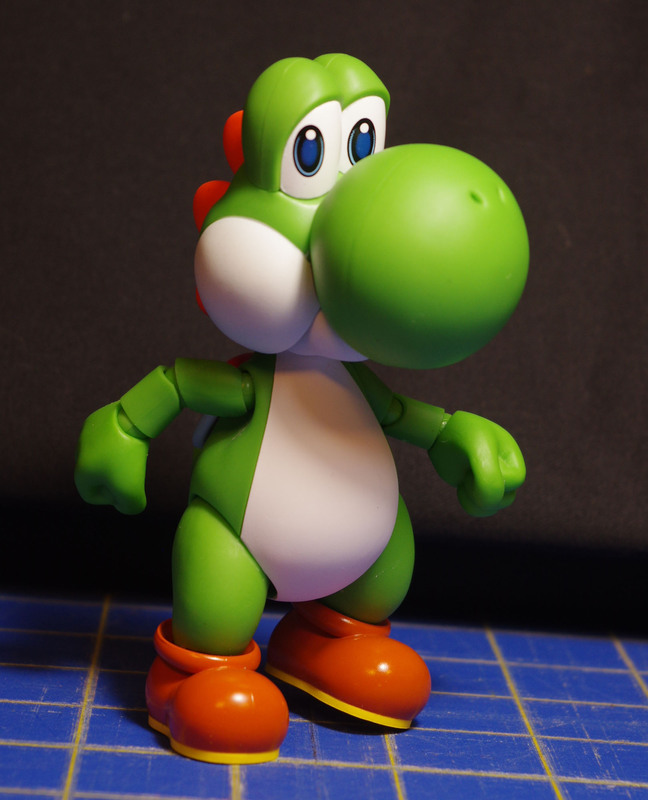 Yoshi’s other accessories are all based on alternate configurations for Yoshi. He doesn’t have any power ups or blocks, likely because Yoshi is a bit larger than either of the Mario Brothers and he has parts like the saddle shell pieces, all of which already drive the price up. One of the driving forces of these Mario Figuarts seems to be keeping them fairly affordable ($20-$40 vs the $50-$100 price of some Figuarts). 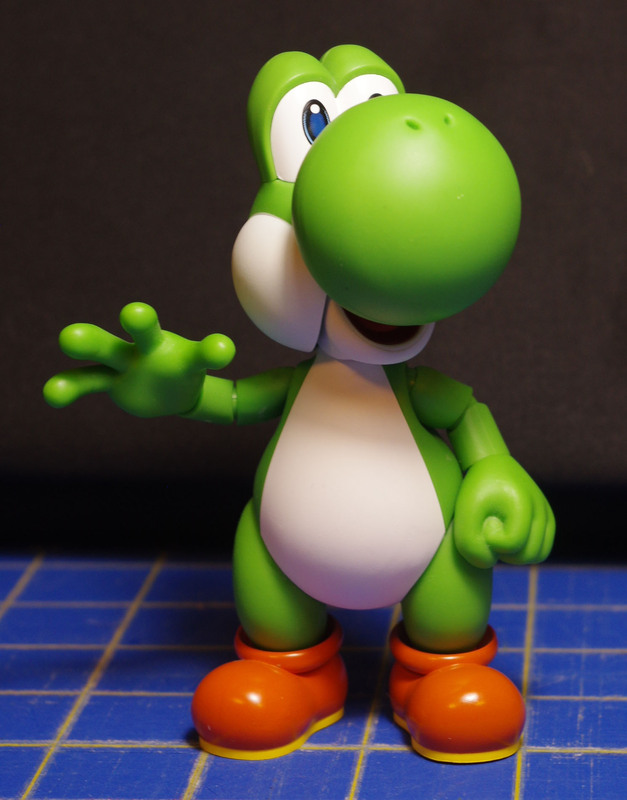 Yoshi includes an extra set of eyes so he can look off to the side, an alternate mouth insert with an extended tongue, and an alternate set of hands. He also includes a stand. He doesn’t need the stand at all to hold himself up under normal power, and the hole for the stand is directly on the bottom of Yoshi anyway, the stand is meant to allow Yoshi to jump or hover like he does in the games. The hands are slightly disappointing. 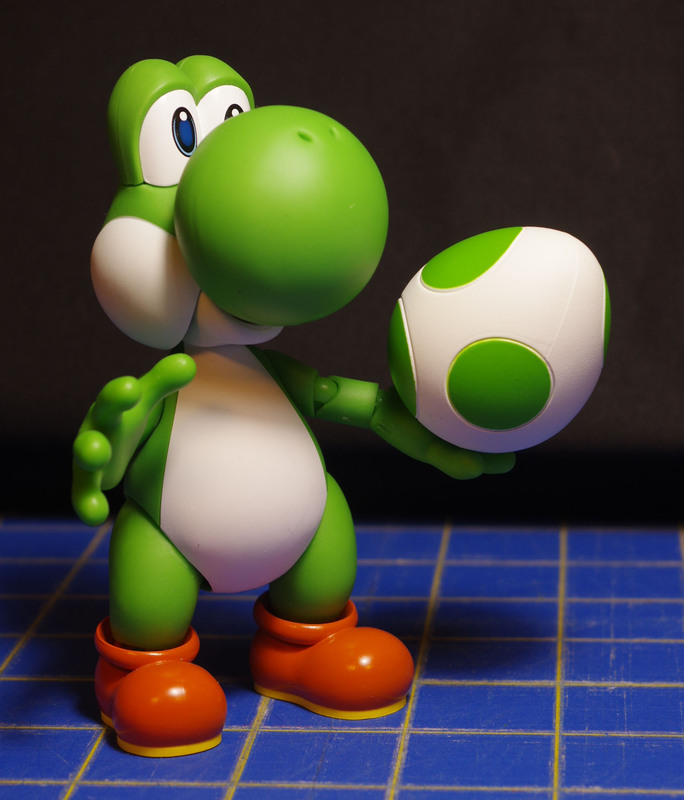 Yoshi has two fists and two open hands, but one of the open hands has an egg permanently attached to it. It doesn’t come off, you’ll only break it trying. Considering the Mario Brothers already gave us a method to attach objects to open palm hands with the turtle shells, it’s kind of disappointing that the egg can’t be removed in this same manner. 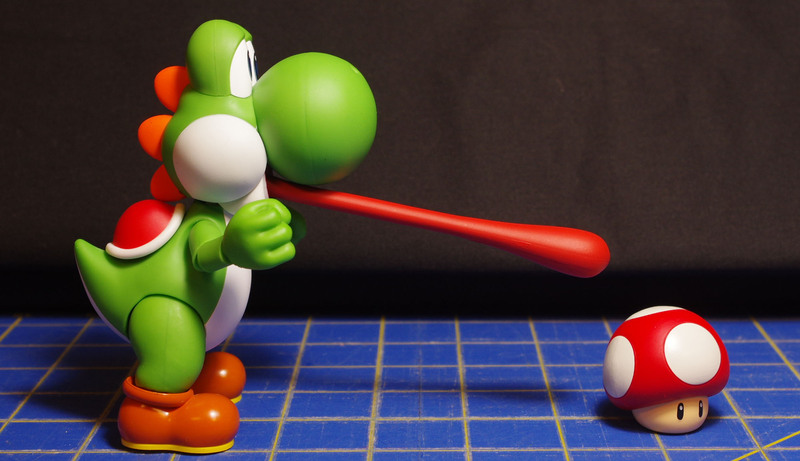 The egg would have made a great accessory for use with the other figures and having two bare open hands for Yoshi would have been a great plus. The tongue is a bit disappointing as well, though it may just be a problem on mine. Basically, it doesn’t stay attached very well at all. It’s not even a problem due to weight or balance, the pegs on the underside of the mouth piece simply don’t properly peg into the pegs in his mouth. The real benefit that the tongue piece provides is that it means the mouth can open and close, something that I imagine wouldn’t have been a feature if it hadn’t been a necessity to allow for the tongue piece to work. While it’s still probably the best Yoshi Figure available, and it’s a good figure to be sure, There are a few little issue that keep it from being completely amazing. Specifically the egg hand and the finicky-ness of how some of the accessories attach. The riding feature really helps push the figure up an extra notch if you have Mario or Luigi to go with him however. 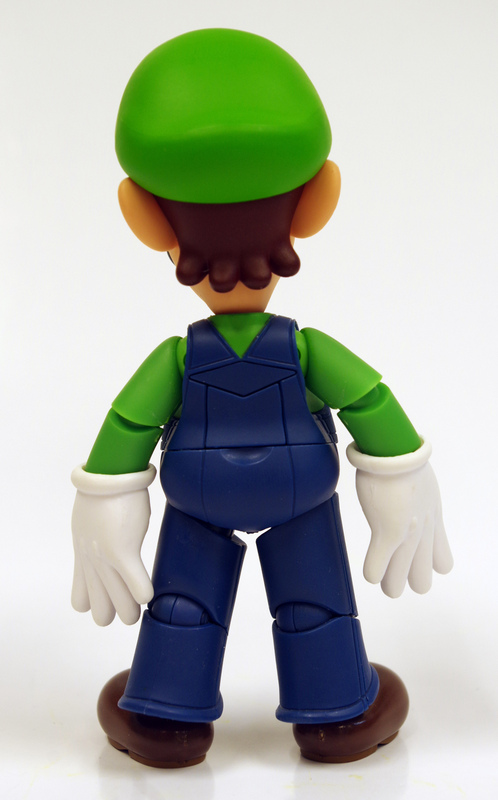 Today’s review is on SH Figuarts Luigi. I’ve previously done a review of SH Figuarts Mario as well that you may be interested in if you’re looking into Luigi. A lot of what was said about Mario definitely applies here. The build quality is solid, the paint apps are great, the sculpt is great, the articulation works for what he is, but it’s a little limited. Where Luigi differs the most is in his accessory count. 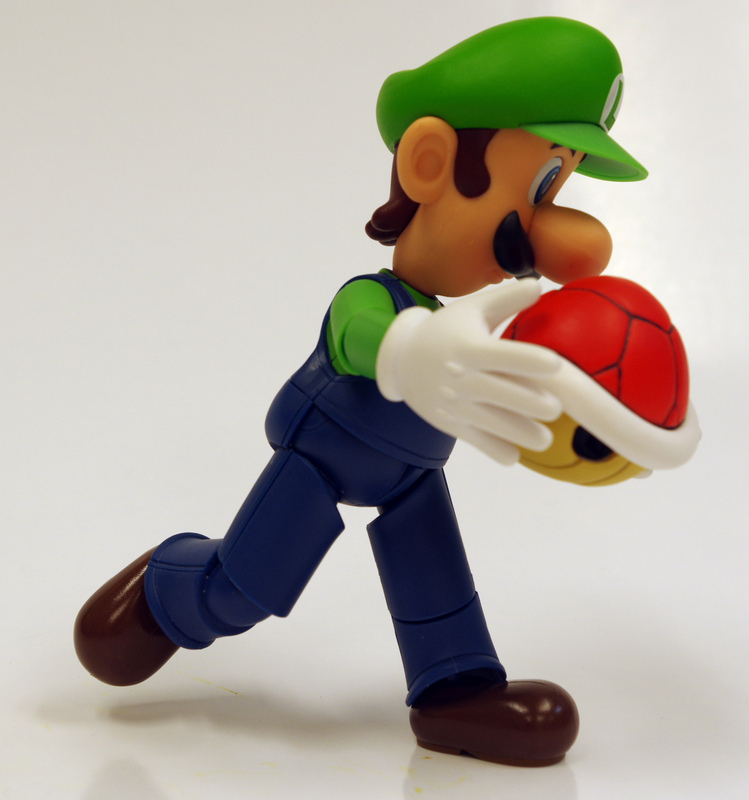 Luigi includes alternate open hands and a stand, both things that Mario lacked in his basic form. Additionally Luigi includes a basic Block Brick and a Red Koopa shell. It’s kind of a shame that he doesn’t have a coin, that feels like it would have been the cheapest accessory to throw in and coins are definitely something you can never have too many of when it comes to Mario. Also included is a swappable back plate to allow the stand to peg into Luigi’s back and a small clear plastic bit that allows the Koopa shell to attach to either of the open palm hands to be held. Speaking of the hands, I touched a bit on the build style on Mario being different that your standard Figuarts release. The hands are another place where this varies. The pegs are nice and bulky and built into the forearms of both Luigi and Mario. The hands stay on well but are easily swapped and it doesn’t feel like there is any chance of breaking the pegs. This is definitely a change from many Figuarts where the removable hands often come off as pretty fragile. It certainly helps that both Luigi and Mario are chunkier than most Figuarts, but it, once again, kind of feels like that Nintendo Quality push sneaking in a bit. 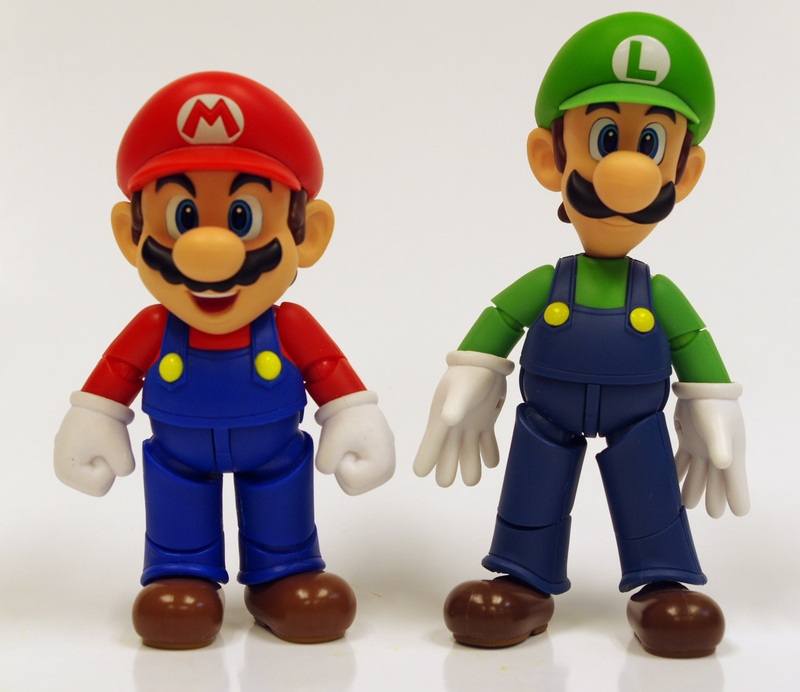 It’s also notable that it’s very subtle, but the hands are not identical to the ones that are available in the Playset Pack for Mario, they are slightly skinnier as well, to match Luigi’s slimmer build. Having the stand and hands definitely help flesh out Luigi’s pose options. 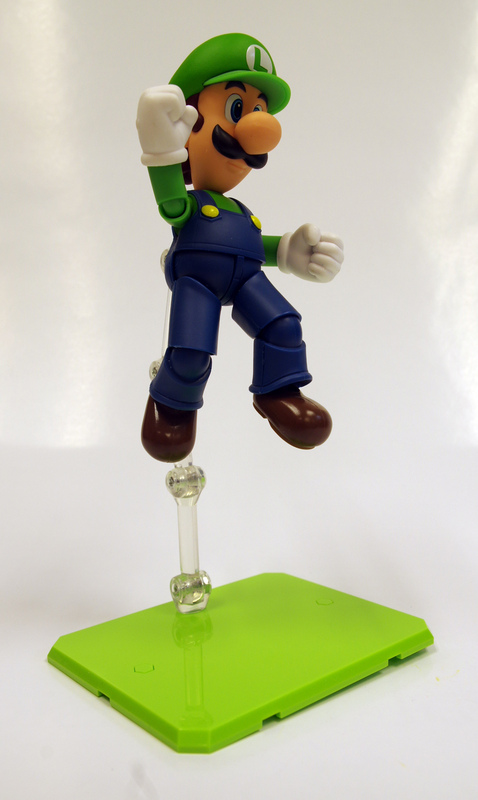 Every since Super Mario Brothers 2, Luigi has been known for his crazy high jumping, so having the stand for jumping poses is definitely a plus. 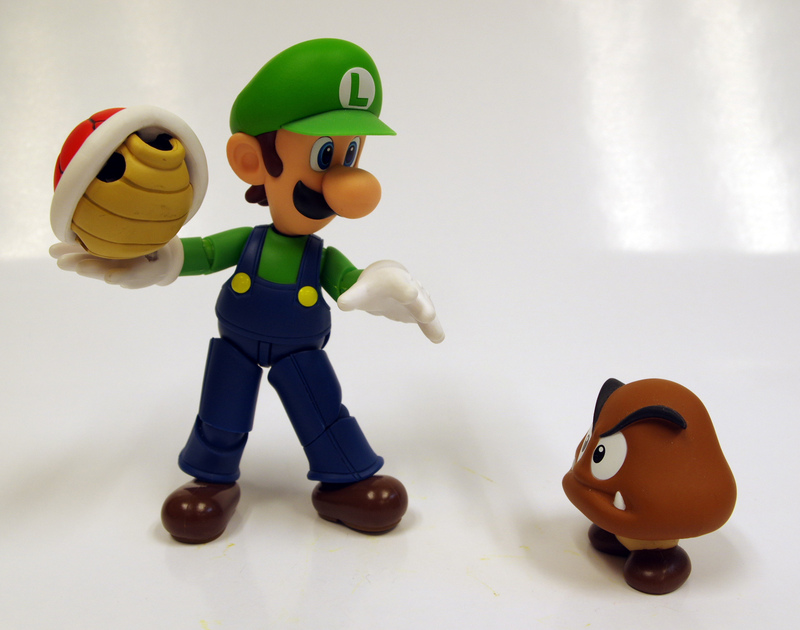 The hands are also great for both carrying and throwing the included Koopa shell. Luigi isn’t a straight recolor of Mario either, he stands a half inch or so taller than Mario and has an overall slimmer build. 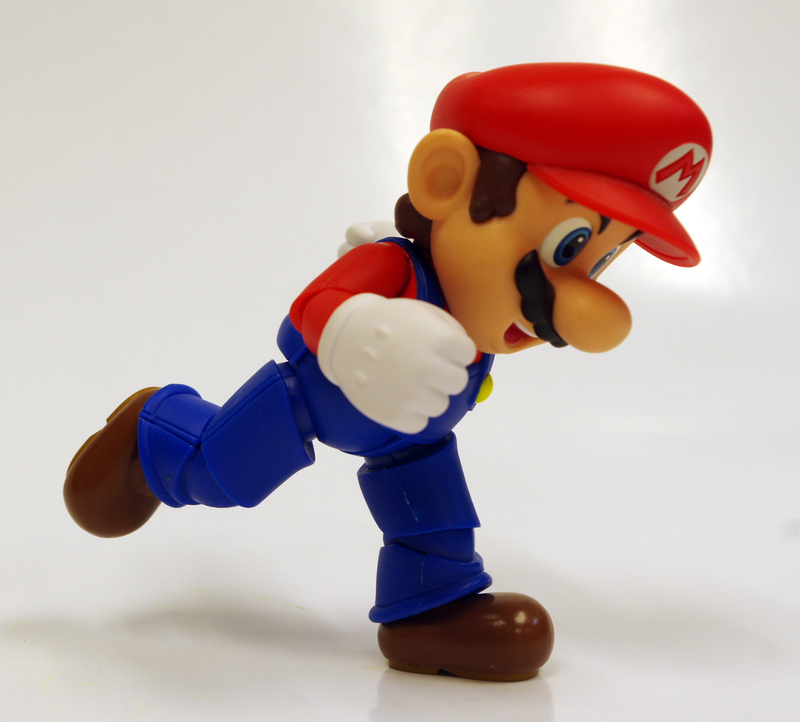 I’m sure there is some parts reuse, I think the arms and shoes are the same, but the legs, center mass, and head are all slimmer and seem to be different sculpting than Mario. All in all Luigi is a nice package. He’s definitely a nice addition to go with his brother Mario but the extra accessories make him a nice solid figure in his own right. 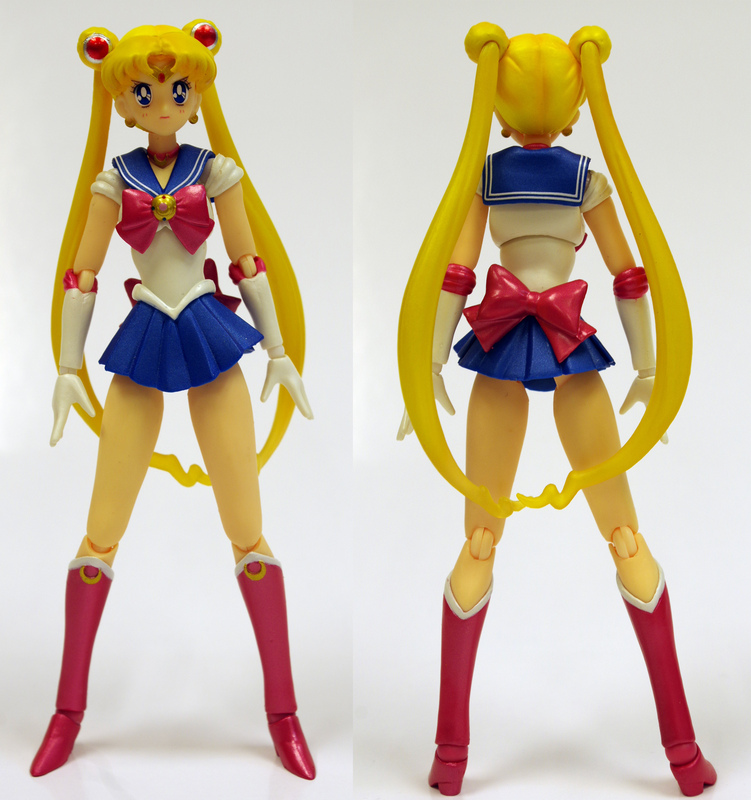 Someone at Bandai must have realized that there is a lot of easy reuse potential in a highly desired show like Sailor Moon or something, because there has been a slew of releases in the Figuarts line for this popular anime in recent years. Sailor Moon is definitely one of the most well known classic anime properties. It seems to have opened up the gates a bit for other older titles. 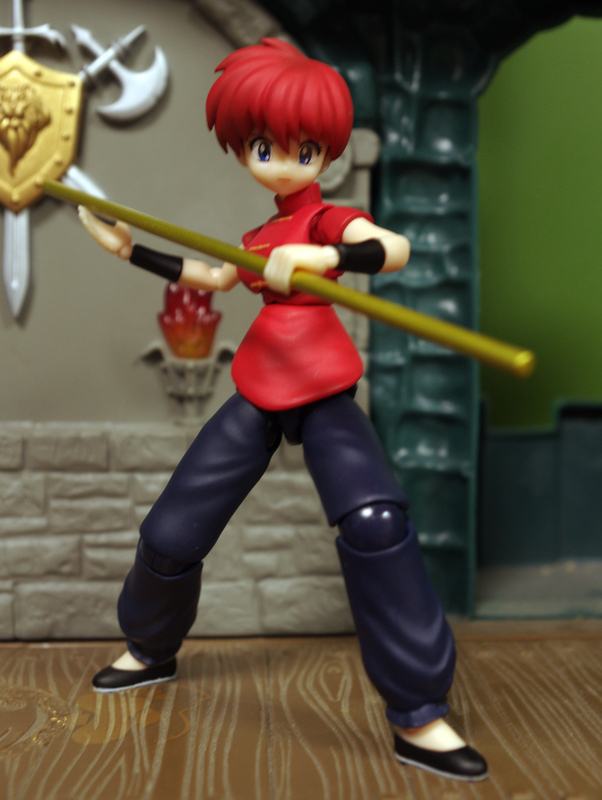 We’ve been getting figures from Ranma 1/2 as well. It makes me wonder how long until they start doing Figuarts of Tenchi characters, another popular title from that era with a ton of characters. The Sailor Moon line up started of course, with Sailor Moon herself. Which is of course the obvious choice, Usagi is the title character after all, if there was only one figure, she’d be the one to be made. 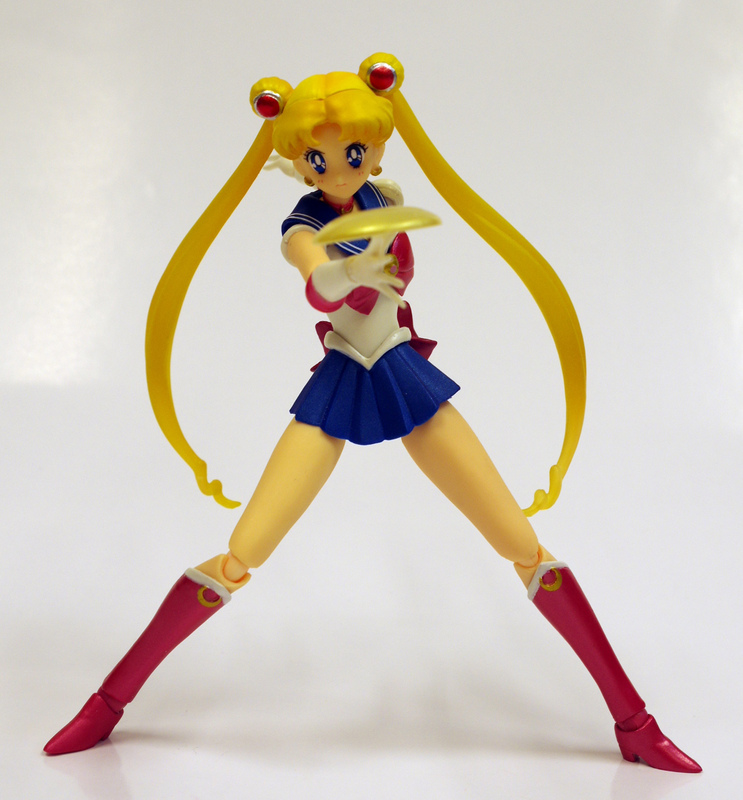 There have been a few rereleases of the original figure and a few variants such as Super Sailor Moon and Imposter Sailor Moon. The figure stands around 5.5″ tall and has all of the ball joints and double jointed articulation you’d expect from a Figuarts toy. There are 6 faces included 5 pairs of hands. 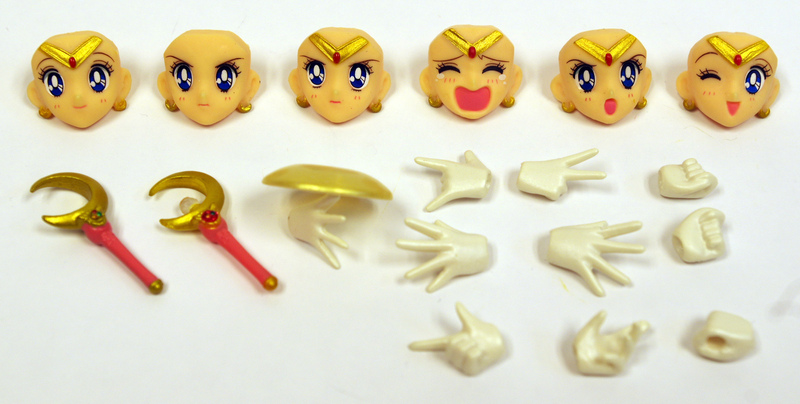 One of the hands has a disk effect part attached to it to simulate when Usagi removes her crown to throw it for an attack. She also includes 2 Moon wands, one lit up and one not, and a special Sailor Moon themed Figuarts stand. Usagi also include a little figure of her cat Luna. Luna has a bit of pose ability in her tail and neck, though getting her to stand up is trickier than it really should be. You’re going to need that stand too. As nice as the figure looks, her long skinny legs and heels don’t give her any stability. 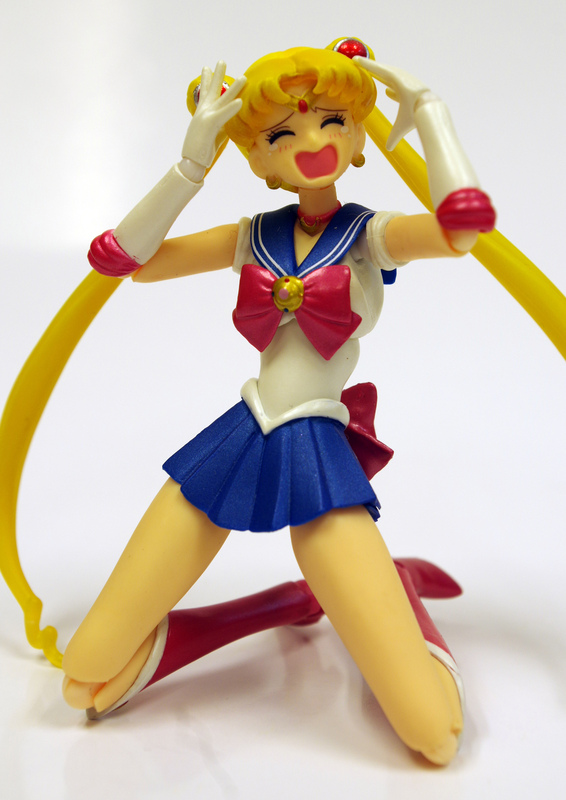 It’s possible to get Sailor Moon to stand up on her own, but it’s not always easy. A few other downsides I’ve come across. First, her hands have a tendency to fall off sometimes. It’s not a constant problem, but it happens. Second, I seriously worry about breaking her hair off. 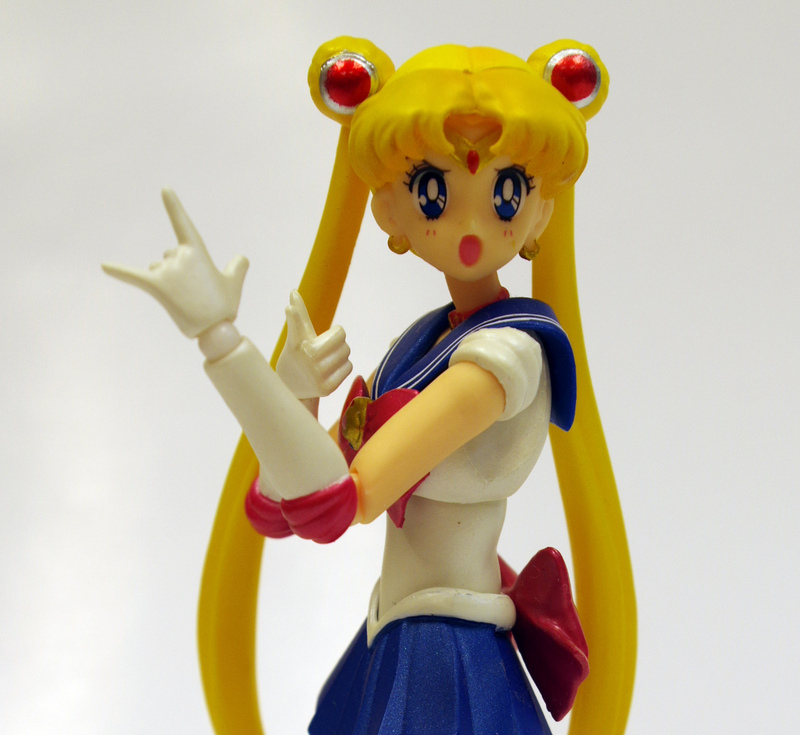 Usagi has her trademark Odango hair with long ponytails. They are made from a very stiff slightly transparent plastic, a type of plastic that, in my experience, tends to easily snap off if pressure is applied in the wrong direction. Overall it’s a nice figure, but I worry a bit about it’s long term survivability. There isn’t a lot that could be done about the balance issue, the design looks like the character on the show, giving her different shoes wouldn’t match what Sailor Moon is supposed to look like, and that’s about the only solution there is to that. Mostly I kind of wish there was a bit of give to the hair pieces, so I wouldn’t have to worry about them breaking. In the end, it’s just nice to finally have an option for a good figure of an iconic anime character. Most of what has been put out for Sailor Moon in the past were Barbie style dolls with a pretty mediocre likeness, even in the Japanese market. Nintendo has long been weirdly stingy with the license for their properties. Sure, there has always been merchandise for Super Mario Brothers, but only recently have they really opened it up, at least for more toy style merchandise. They seemed to have opened the flood gates too, between the Amiibo figurines, and the World of Nintendo toy line. There is also a line put out by Bandai under their S.H. Figuarts lineup. 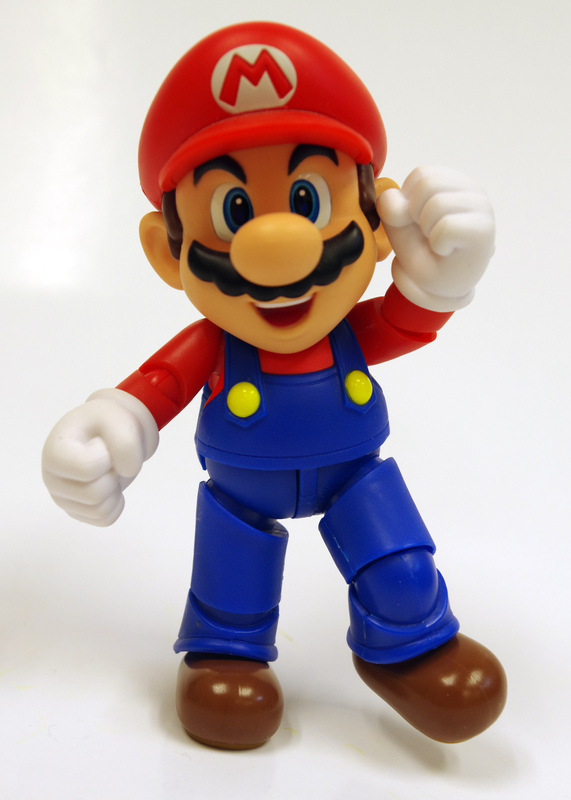 World of Nintendo is alright, but if you want the “Cadillac level” of figure, you’re going to want to spring for the Figuarts Mario. 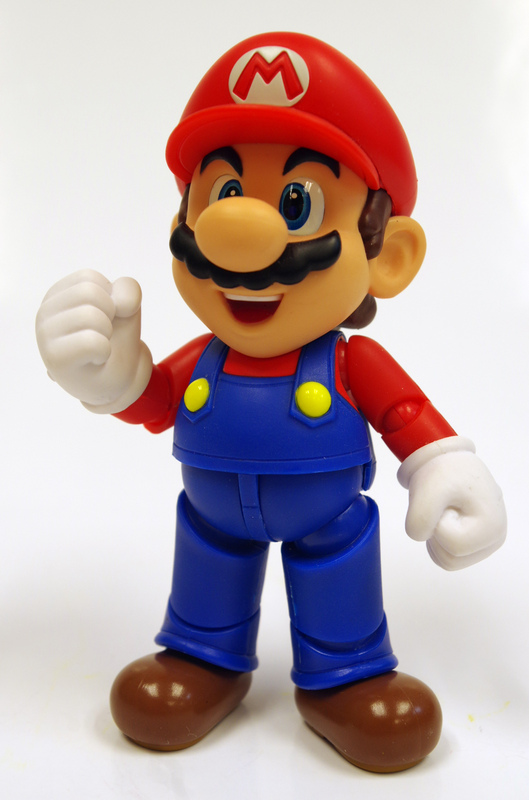 Figuarts Mario is a bit of a departure from the standard Human figures put out in this line. Sure Mario is human, but he’s considerably shorter and ore stocky than your average anime school girl. The joint system all around also feels a lot more study than the other Figuarts I’ve handled. I’m not saying the others are garbage, just that Mario here definitely seems to have a different mindset in mind on his design choices. It kind of feels like that whole “Nintendo Quality” hand was probably involved in the design of this figure a bit to make sure he looks nice and solid in most poses. This also is almost a determent however. He can make a lot of “classic Mario poses” but he’s also limited in a lot of ways due to his sculpt. He can’t stick his arms out from his sides, for example, due to how his shoulders work. He doesn’t have any alternate faces either. In fact eh doesn’t have any alternate parts at all, though there are some alternate hands included in one of the accessory packs. What he does include is a Power Mushroom, one coin with stand, and a ? Block. There isn’t even a stand (That is also in an accessory pack). He’s plenty solid enough to stand without the stand though having one to do jumping poses would have been nice. There is an upside to the lack of extra parts however, and it kind of makes the whole argument moot. 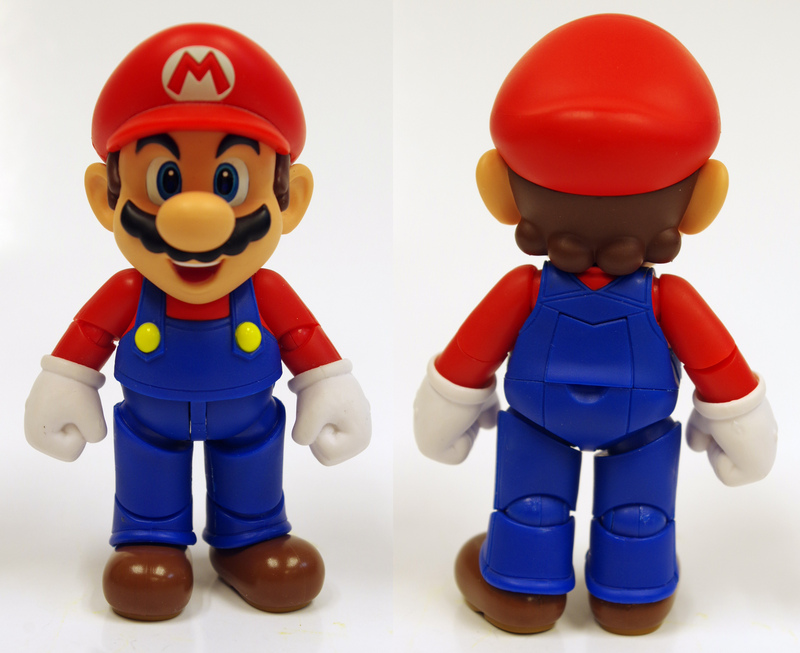 Mario costs considerably less than your average Figuarts toy. 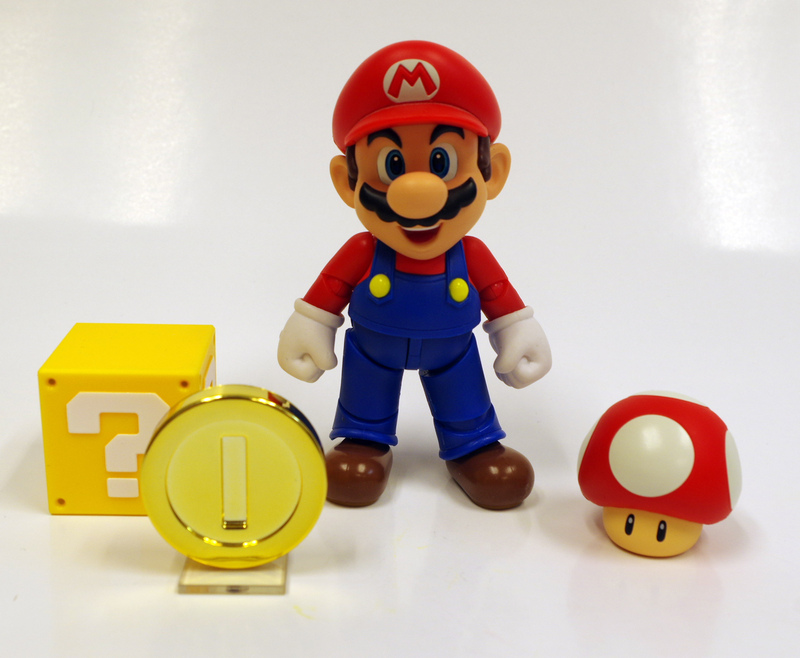 In fact Mario plus the two initial “Playset” packs, probably puts him about your average Figuarts price, with an above average number of accessories. Accessory woes aside, the figure is really nice. It’s build solid, as mentioned and the sculpt and paint are all spot on perfect for a modern Mario. Despite his limited articulation, he can pill off a lot of very Mario-like poses. Mario isn’t exactly a Ninja after all, he’s a fat, squat plumber. SH Figuarts Mario pulls this off nicely. I’m getting real close to finishing up the Juggernaut Build a Figure now after picking up Iceman. All that’s left now is Jean Grey. Honestly both of these last two are kind of hard to swallow, they really are the more boring figures of this wave, especially Jean. I’ve never been a big fan of Jean/Phoenix/Marvel Girl whatever you want to call her. Iceman is alright, he’s just a little bland. 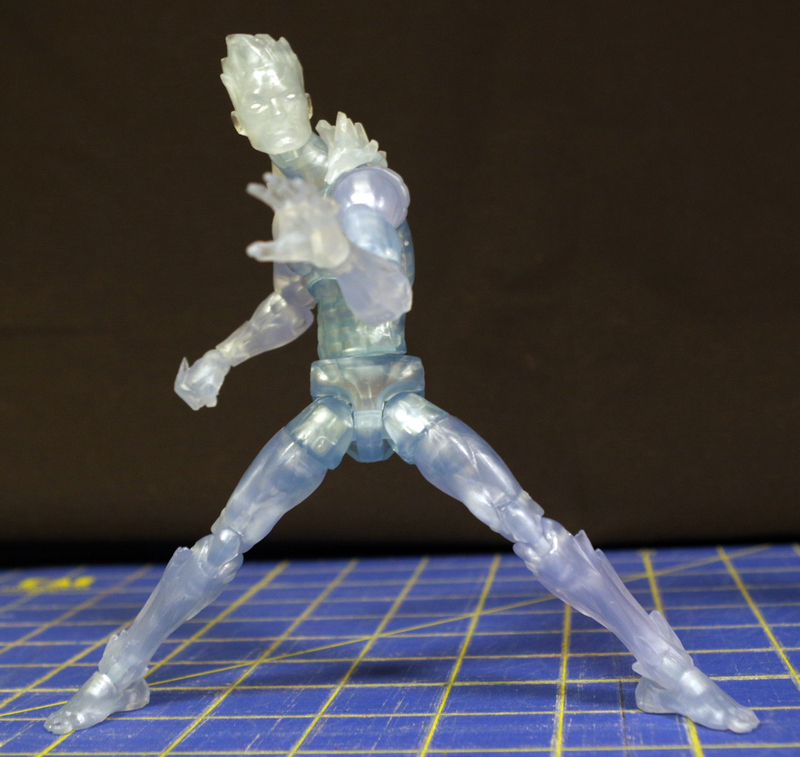 He’s got a lot of good pose ability, he’s got an interesting clear ice design going, he’s got little spiky bits and toes. By all accounts, he should BE INTERESTING at least a little. This is really a case where a lack of accessories on these figures hurts, especially when so many figures in this wave had quite a few accessories, like Cable and Deadpool and Kitty Pride. Some sort of Ice weapon or frozen display base would have been nice. I’m really enjoying the way Bandai seems to be bringing in old Anime/Manga lately to give them nice high end figures. Well, they’ve probably been doing this, I just have noticed because they are doing shows I like. Somehow I doubt I ever see a Figuarts for Iria or Gunsmith Cats, but I can hope. Ranma seems to be slated for a pretty good line up, the first was the girl version of Ranma, the second seems to be Shampoo, then Male Ranma and Akane. I really hope they continue and put out Ukyo and Ryoga. I believe there was also a Figuarts Zero Panda Genma, but I’m not too keen on Statues. I mentioned last week when talking about Figma Motoko, how I prefer Figuarts to Figma. Getting Ranma so soon after Motoko really drives this down. Motoko is a nice figure, but Ranma is definitely better. Ranma has a slightly nicer sculpt, about the same amount of accessories, generally better joint design, and she is also a lot more stable and solid than Motoko. Every time I remove one of Motoko’s hands, the join comes off with it from the wrist, and I’ve found her hair piece tends to fall off sometimes. I haven’t had these problems with Ranma. I’m not saying that the Figma is bad, I’m just saying, back to back, it really drives home why I prefer Figuarts. Anyway, I don’t want to turn this into some full on review. Also, this isn’t part of my other import figures that I teased last week.